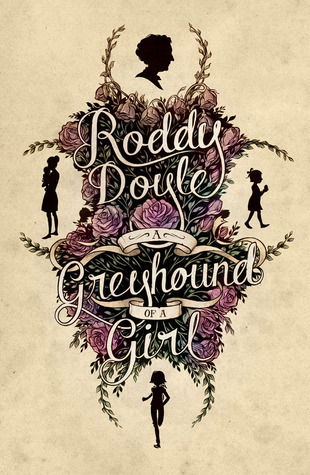 A Greyhound of a Girl by Roddy Doyle. U.S. edition Amulet/Abrams, 2012, New York, NY. This story, about a great-grandmother ghost and her very much alive great-granddaughter, is typically Irish. I say that with some hesitation, because I am not Irish and my experience with Irish stories is that they usually end badly. Reading Morgan Llywelyn’s series she calls The Irish Century I was alternately shocked, angered, and tearful. And don’t even get me started on Leon Uris’ Trinity. But A Greyhound of a Girl is a novel for the younger of the young adult set. It does end well, and in the meantime the reader will get the impression that it’s not “at all, at all,” unusual for ghosts to be walking around Dublin talking to folks cleaning up some unfinished business or other. A Greyhound of a Girl starts with twelve-year-old Mary who has a variety of problems. Her best friend has moved away, she thinks her mother’s speech pattern is too full of exclamations (She tells her mother, “Even your whispers end in!! !s,”) and her granny is in the hospital, probably dying. Then she meets this old woman walking home from school one day. Using flashbacks to tell the story of one family’s history, Mary learns about her granny’s past and lives through some exciting days in the present. Read this one and enjoy. It is delightful and different from anything else I’ve read. 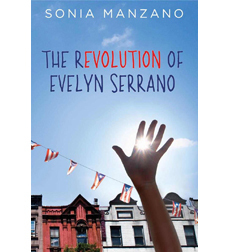 The Revolution of Evelyn Serrano by Sonia Manzano. Scholastic Press. New York, NY, 2012. Evelyn’s life is turned upside down when her eccentric, and revolutionary grandmother, comes to live with her family in their 1960’s barrio of New York. Evelyn, whose first name is Rosa, decides to take her middle name, Evelyn, because there are so many Rosas in the neighborhood. At the cusp of womanhood, she questions her Puerto Rican heritage and dislikes how her mother acts: “I hated that beggy voice of hers. She sounded like a slave.” Searching for her identity as a unique individual, she fixes up her own bedroom, not “decorated in late 1960’s Puerto Rican décor—plastic covering all the furniture and fake roses everywhere. Which was Mami’s way of making our home look pretty.” Evelyn’s room is off-limits. When her flamboyant Abuela comes to stay and takes over Evelyn’s bedroom with “scarves, tops, and skirts in bright colors” make-up and jewelry everywhere, Evelyn escapes to el roofo to find some privacy and hang out with her friend, Angel. She soon learns that her own mother does not know her grandmother well at all because Abuela was always off somewhere, fighting for some cause when Mami was growing up. The two fight constantly: Evelyn’s mother, the conservative averse to risk; Abuela, the free spirit who finds a cause right there in Evelyn’s own neighborhood. At first angered by her grandmother’s presence, Evelyn undergoes a change herself, and becomes determined to make her grandmother’s cause her own. In the process, Evelyn discovers her own heritage and a new relationship with her mother. The Revolution of Evelyn Serrano gave me insight to a place and culture I knew little about. Although I, too, was a teen in the 60’s, I was never exposed to or heard about what went on the barrio. Living near Milwaukee, I knew of the African-American struggles for open housing in that city and the marches led by a “radical” priest named Father Groppi. I was not even familiar with the word, barrio. This book opened my eyes to another culture’s history during a tumultuous time in our own American history.